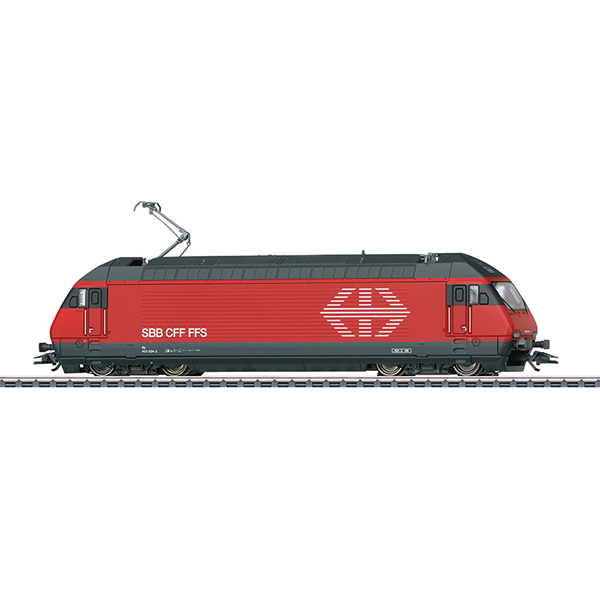 Prototype: Swiss Federal Railways (SBB/CFF/FFS) class Re 460 fast general-purpose locomotive. Neutral "Fire Red" basic paint scheme. Locomotive name: "Aare", road number: 460 034-2. The locomotive looks as it did in 2015. Model: The locomotive has an mfx+ digital decoder and extensive sound functions. It also has controlled high-efficiency propulsion, centrally mounted. 4 axles powered. Traction tires. The triple headlights and dual red marker lights change over with the direction of travel, will work in conventional operation, and can be controlled digitally. The headlights at Locomotive Ends 2 and 1 can be turned off separately in digital operation. Long-distance headlights can be controlled digitally. The lighting changeover can be changed between the Swiss code and white/red. The cab lighting can be controlled digitally. Maintenance-free warm white and red LEDs are used for the lighting. The locomotive has new, finely modelled single-arm pantographs. The locomotive has separately applied metal handrails. The engineer's cabs have interior details. Length over the buffers 21.3 cm / 8-3/8". New, finely modelled single-arm pantographs. Centrally mounted motor now included. All four axles powered. European and Swiss light changeover. This model can be found in a DC version in the Trix H0 assortment under item number 22948.